Dr. Sara Irina Fabrikant is a Professor of Geography and currently Vice President of the International Cartographic Association (ICA). 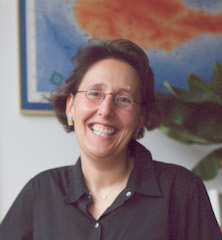 She is the past chair of the ICA’s Cognitive Visualization Commission. Her research interests lie in geo-visual analytics, GIScience and cognition, and dynamic cartography. She is currently the appointed head of the Geography Department at the University of Zurich (UZH), where she also heads the Geographic Information Visualization and Analysis Group (GIVA) at its GIScience Center. She was recently elected to the Swiss Science and Innovation Council, advising the Swiss Federal Council for issues related to science, higher education, research and innovation policy. She has been the program committee co-chair of various conferences (e.g., AGILE 2008, GIScience 2010, CartoCon 2014, COSIT 2015), and also serves as a member of various editorial journal boards in her field of research. Other professional service includes memberships and functions with the Association of American Geographers, the North American Cartographic Information Society, and the Swiss Society of Cartography. The information society increasingly relies on visual analytics displays for monitoring and guiding every-day movement through space-time, and to support respective decision making tasks. However, we still have a poor understanding on how autonomic nervous activity might influence the already limited perceptual and cognitive resources of such display users, for example, in time critical situations on the go (e.g., navigation) or in visuo-spatial decision making situations of high ethical valence (e.g., air traffic control, disaster mitigation and response, etc.). In this talk I will highlight ongoing empirical research on animated and mobile graphic display use in the lab and in the wild, capitalizing on ambulatory human behavior sensing methods (i.e., eye tracking, galvanic skin response, and EEG measurements). With this collected empirical data and supported by cognitive/vision theories we are guiding the process of designing user, task, and context responsive graphic interfaces not only for timely and thematically relevant information, but also for perceptual salience, and positive engagement. In doing so, we aim to create usable and useful geovisual analytics tools for the increasingly mobile information society.